Heneghan’s Dunwoody Blog: City of Dunwoody 2019 Retreat Documents and a proposal from Transit X for last mile connectivity. 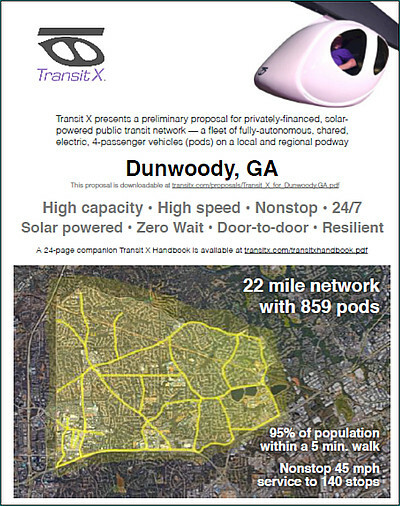 City of Dunwoody 2019 Retreat Documents and a proposal from Transit X for last mile connectivity. The Dunwoody City Council along with various members of City Staff sat in a room for several days talking about the past, as well as our intentions for the future. We were briefed by staff and outside groups on items of importance so that we could set policy moving forward to improve various aspects of our community. I didn't document every conversation as I was ensuring that I listened attentively to the other council members, and weighed in to effectively to be engaged but I can tell you that both the Dunwoody Crier and Dunwoody Reporter were in the room taking notes and I expect news stories coming out from each. Being able to sit through numerous conversations with six other decision makers, listening to everyone's opinion and weighing what is best for the city is truly an honor. There are times in which don't always agree with each other but just knowing that everyone in the room wants what is best for the City, I easily accept their opinion as coming from a position of love and therefore at the end of the day our tweaked final compromised decision is usually a good one. Thank you to the members of staff, the Mayor and my fellow council members who made this years retreat a valuable exercise. Below are the links to the documents discussed the last few days. Last night in reviewing the jump drive with these electronic documents, I saw that there were a few slides discussing an overview item on a mass transit idea called Transit X that I had never heard of. After researching quickly on line, I shared via Twitter that we would be discussing this item and then today the Transit X company replied back to my tweet with a 13 page proposal on what the service could look like within the City of Dunwoody. I am also sharing that document here even though it was not requested by the City, it was provided blind without knowing on our communities special transportation needs nor has the city council or staff seen this proposal. They posted it on Twitter making it a public document and therefore figured I would share. John: That pod idea was presented to the PCID somewhere around 2009. I went to the meeting and wrote a blog post about it titled something like "Do We Widen Our Streets or Widen Our Minds?" but my saved posts only go back to about 2013 now. You may be able to find info about that meeting somewhere else, if it helps to see the history on this seemingly-crazy idea. I remember being on the fence about it then and my reaction to it is two-fold now as well.